Body camera footage appears to show Officer Richard Pinheiro placing a can with drugs in a trash pile and returning later to seemingly discover it. A grand jury indicted him Tuesday. A grand jury in Baltimore has indicted a police officer who was caught on video appearing to leave drugs in a spot and then come back to recover them. 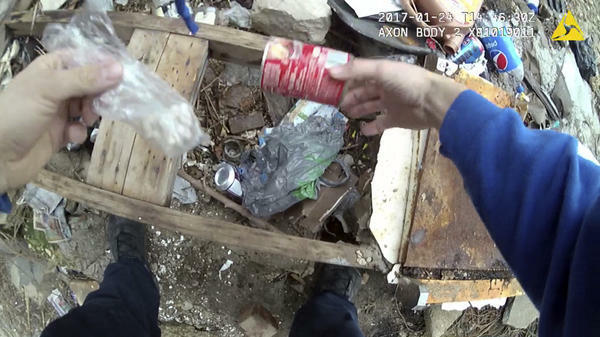 A video released by the Baltimore public defender's office in July showed Officer Richard Pinheiro in January 2017 holding a can with a plastic bag in it and placing it in a pile of trash in a backyard. He then goes to a sidewalk, activates his body camera and quickly returns to "find" the can with a plastic bag of capsules in it. He may not have been aware that the camera would record 30 seconds of video prior to its activation. The Office of the State's Attorney for Baltimore City said Wednesday that a Baltimore City grand jury indicted Pinheiro on charges of "tampering with or fabricating physical evidence" and misconduct in office — committing a "wrongful and improper act in the performance of his official duties." The evidence tampering charge is a misdemeanor with a maximum penalty of three years in prison and a $5,000 fine; the second charge is a "common law offense," the office says, which enables the court to impose any sentence that is not cruel and unusual punishment. After the video surfaced in July, a man who was arrested and jailed for months on charges related to that incident was released and the public defender's office said it was questioning 53 cases Pinheiro was involved in. Pinheiro was suspended with pay, and two other officers at the scene were put on administrative duty. Former Baltimore Police Commissioner Kevin Davis had suggested it was also possible that officers were simply re-creating the finding of drugs that "they had already discovered, in order to document their discovery with their body-worn cameras on." Davis was fired last week, as Baltimore's mayor criticized him for failing to reduce the city's homicide rate. Another video that emerged over the summer showed Baltimore police swiftly finding bags of drugs in a second search of a car. "The Baltimore police internal affairs office is investigating."